Posted by jeremyliew in Consumer internet, gaming, Internet, social media, social networks, user generated content. I’ve posted in the past on applying game mechanics to social media. Robb Web’s blog pointed me to a fantastic lecture by Luis von Ahn about how to design games to take advantage of human computation. In effect, he gets people to solve problems that computers can’t by making them into a fun game that people want to play. His research interests also include Captchas, automated tests that humans can pass but that current computer programs cannot. The most common version of this is the distorted set of words and numbers that you sometimes have to type when getting a new account or entering a comment on a blog to prove that you’re human. I believe this lecture was part of the Google Tech Talk series. It was given in July 2006 and was widely covered at that time, but I missed it. Examples of the games that von Ahn has developed include the ESP game that gets people to tag images, the Peekaboom game that gets people to identify objects within an image, and the Phetch Game that gets people to find a particular kind of image on the web. I’ve played them all, and they are all pretty fun! This guy is a genius. The a video is about 40 minutes (with another 10 minutes of questions) but it really is time well spent. I don’t make a 40 minute recommendation lightly. Searchengineland points to an interesting article in PC World which pitted the top search engines against each other to determine which had the best (ie most relevant) search results. two other services topped it–barely–in our text-search tests. These results don’t differ all that much from what we found in testing the various search options at AOL when I was there a couple of years ago. When stripped of UI and branding, most users couldn’t tell the difference in quality between search results. When UI and branding was returned, most people thought that Google was the best search engine. This speaks to the power of branding in the third phase of competition of consumer internet companies, as I have blogged about in the past. First comes distribution, then product and finally branding. It explains why, even though Google’s general web search isn’t head and shoulders better than the other search engines any more, it continues to win market share. Posted by jeremyliew in advertising, business models, Consumer internet, Internet, social media, social networks, start-up, startups, user generated content, viral marketing, web 2.0, widgets. The broader theme here, IMO, is that of users voluntarily affiliating themselves with brands. Offline it’s the Nascar jacket or the Firefox T-shirt – not only does it advertise a brand, but users PAY for the privilege of doing so. As always, when you see offline analogues to online behavior, it’s a good sign. But as I have blogged in the past, new forms of advertising are hard until standards emerge. What the industry really needs is for the social media players to get together with the IAB and create some standards for “user affiliation” ad units. The widget makers (Youtube, Rockyou, Photobucket, Slide, Clearspring, Widgetbox etc) and the smaller social networks (led by Freewebs as this Washington Post story notes) are already trying to do this, but until Bebo, Myspace, Facebook and the big portals (AIM Pages, Microsoft’s Live Spaces, Yahoo 360, Orkut etc) get on board, it will be hard to get enough attention from the marketers who must also agree to the standard setting process. These big players, who already have relationships with advertisers, must start the conversation. Standards will be good for the whole industry. The sooner we get standards, the sooner social media/user affiliation marketing can go from being a custom business development deal every single time, to a line item in the spreadsheet of every media buyer at every agency. Posted by jeremyliew in Consumer internet, Internet. Let’s peel back the onion a little, and look at these websites by category. Twenty one of the websites – more than half, fall into the category of homepage. Many of these are ISP websites (e.g. Adelphia.com, Optonline.net, Compuserve.com, Peoplepc.com etc), with the balance being portals and search engines (aol.com, yahoo.com, live.com, google.com, etc). One anomaly jumps out – officialsearchlist.org. It turns out that Officalsearchlist.org has around 600k users and they looked at only 16m pageviews from their 9m visits to the site, spending on average 30 seconds. This suggests a relatively low level of engagement. It may be that some of the users of this site have had their homepage reset to officialsearchlist.org and don’t know how to change it. The site has a large section of myspace layouts and it is possible that some less experienced users changed their homepage while getting a myspace layout. The high proportion of homepages in the list of most frequently visited sites emphasizes the power of the default, which I have posted on before in a slightly different context. Inertia is a powerful force, not to be underestimated. Capturing the first page that a user sees when they start their browser can drive a lot of usage. 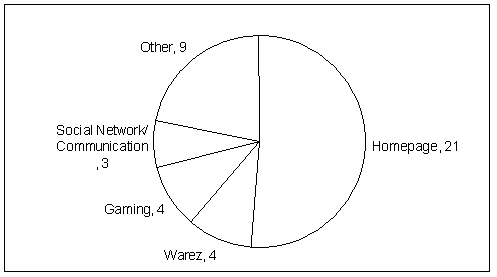 The next category on the list is gaming, with four sites; World Of Warcraft, Pogo, Webkinz and Runescape. I’m sure most readers will be familiar with WoW, Pogo and Runescape. Webkinz is a very interesting offline toy – online game hybrid launched by Ganz in late 2005. Ganz has been making plush toys for years, but with Webkinz they gave each toy a unique secret code that allows kids to take care of their pet/toy online and play games with it. It has gone from nothing to over 4m UU/mth since then. Webkinz is part of a very interesting trend towards offline-online hybrid services that I will explore more in a later post. The Warez/Download category also has four sites on the list. Overall traffic levels for these sites are all sub one million (versus the gaming sites which were all in excess of 4 million with the exception of WoW at 1.7m). It’s not a surprise that people like to get free music and movies. Communications and Social Networking sites have three representatives on the list (Myspace, Facebook and Hotmail). They are all huge – between 20-60m UU/mth and between 6-43 billion PV/mth. Communications/webmail are also a major driver of portal site traffic. The three count likely under-represents the importance of communication as a driver for frequent visitation of online websites. ALURIASOFTWARE.COM. Anti-spyware software – likely updating spyware signatures at each log-in. DRUDGEREPORT.COM. Often controversial news site – devotees may be bigger news junkies than followers of other news sites? CHRYSLER.COM. Chrysler said that it intended to spend over $1bn in online advertising in the second half of 2006. Perhaps its paying off? Although GM.com wasn’t far behind at 9.8 visits/month, other Auto OEMs like Toyota and Ford had just 2 visits/month. WHATISMYIP.COM. Tells you your IP address. Can’t explain why this gets so much usage. CLEMSON.EDU. Clemson University’s website. This may be set as the homepage for Clemson university students? ADP.COM. ADP provides HR services such as payroll, 401k, and benefits administration. It also offers time and labor management on a SaaS basis – perhaps some workers need to clock their hours on ADP’s website to make sure that they get paid accurately? TDAMERITRADE.COM. Are they the online broker of choice for active traders? Schwab and eTrade average just over 5 visits per month. PLENTYOFFISH.COM. Free personals website. This rate of visitation is significantly higher than that of paid dating sites such as Match.com. Perhaps free is good, just as with the Warez sites. Oddly though, the other free personals website, okcupid, does not see the same high visitation rates that Plenty of fish does. Am I missing a connection with some of these sites in the “Other” category? Some plausible explanations in comments – add your thoughts! Posted by jeremyliew in business models, Consumer internet, Ecommerce, media, start-up, startups, VC, Venture Capital, web 2.0. I spoke today at the Web2.0 expo on the topic of how this generation of internet companies can make money under both media and e-commerce models (Show me the money). This is an expansion of previous posts I have written on this topic. I go into more detail on this and lay out the math as to how big you need to be to both breakeven and to be a public company under both business models. Posted by jeremyliew in Consumer internet, social media, social networks, user generated content, web 2.0. I’m particularly interested in social media sites with traction focused on topics appealing to endemic advertiers. Social media sites because of their extraordinary ability to grow without incurring marketing costs, and endemic advertisers because of their willingess to pay double digit RPMs to reach that audience. For such social media sites (where the key driver is not communication as it is at the broad reach social networks), there is usually a distinction between the readers and the writers of content. Much has already been written in the past about the ratio of writers to readers in social media; the 1:99 ratio, or as some have put it the 1:19:80 ratio. I like to think about these three groups as the Creators, Curators and Consumers of content. Just like in the Art world, there are those who create art, those who tell us which art is good, and those (like me!) who merely admire the art. Some best practices are starting to emerge for how to encourage all three types of user. Creators are critical to social media sites because they generate the content; without them you have nothing. Creators use the keyboard – they write, cut, copy and paste. In most cases, creators do what they do for passion, not for money. They need to be celebrated and highlighted on your site to give them the adulation that they seek, and to keep them creating content. This means focusing on positive feedback for the creators (e.g. do you really need a thumbs down? Or is a thumbs up enough, with the lack of thumbs up being information enough), prominently displaying the metrics that drive behavior you desire, and providing them with leaderboards and other ways to distinguish themselves. Consumers are critical to social media sites because they are the drivers of pageviews, and hence advertising revenue. Consumers use the screen – they merely navigate around your site, and do little or nothing to add to it. But because they outnumber the other groups so significantly, they dominate your monetization opportunity. Because of their weak connection with your site, consumers need help to discover the content that they will enjoy. They may not be regular visitors to your site – they may never have been to your site before. Your challenge is to maximize their chances of discovery. At a minimum, this should include search engine optimization and social media optimization (digg, delicious, stumble etc). Ensure that high quality content with mass appeal is well presented, has well written title, is grouped together appropriately, and is easily found, and that you are not “foot faulting” by your page construction or URL structure. Equally important is helping consumers discover new content once they are on your site. Some of this comes down to the basics of click density (more links means higher clickthrough rate) and programming the home page. But as more traffic comes in “from the side” due to SEO, (rather than from your home page) you need to make sure that you have an efficient mechanism of prompting the “next click” on every page. This can include collaborative filtering (people who read this also read that), related content (whether through taxonomies or folksonomies), most popular content, or through other tried and true mechanisms. Curators tie these two groups together. Not all content that the Creators create is of equal quality, and the Curators perform an important filtering function to bubble the best content to the top, hence keeping the Consumers happy, engaged, and coming back. Curators use the mouse. They click to vote/digg/rate. These actions are what give the Creators the attention and affirmation that they are looking for. It’s important to make it very easy for Curators to give their feedback. This means making the feedback process as close to frictionless as possible. The feedback mechanism should be immediately adjacent to the content that is being rated. Such clicks should be part of rich internet application, and not take you to another page – there should be no “wait time” penalty for providing curator feedback as they wait for a page to load. Ideally, it will not require registration, or registration will be kept as light as possible. Since Curators use the mouse, avoid them from having to touch a keyboard as much as possible. While this construct is a useful framework, it isn’t absolute. There are occasions when you can mine the behavior of Consumers to drive some measure of the quality of the Creators work. Without requiring active participation, the metadata that Consumers generate in choosing to read or not reach an article, click or not click a link, play a game many times or quit half way, and other such behaviors implicit in their clickstream can also be used to judge the quality of the content that they are exposed to. I’d be interested to hear from readers about which sites do a particularly good job in encouraging each of these three groups. Posted by jeremyliew in Consumer internet, gaming, Internet, social media, social networks, start-up, startups, user generated content, web 2.0. I posted recently on the importance of context for social media sites; the need to be “easy to learn and hard to master”. Two recent stories/posts have reminded me on the consequences of failing to adhere to this approach. The most recent was a story in Sunday’s Washington Post that I found via Paul Kedrosky. It tells what happens when Joshua Bell, one of the world’s finest violinists, plays his $3.5m Stradivari violin in a subway station in downtown Washington DC during the morning commute, looking like an ordinary busker. He is not exactly appreciated. In forty five minutes he receives 27 donations totalling $32.17. Of 1070 passers by, exactly seven stop to listen. This is a guy who fills concert halls where the cheap seats are $100. … sort of a structural flaw with our news pages. They didn’t conform to any standard web page metaphor. Let me explain what I mean by that. Back in 1995, when the web was new, visitors to a new site would lean forward, squint at the page, and try to figure out how it worked. The Southwest Airlines page was a picture of a check-in booth at the airport. You had to click on the picture of the phone to get the phone list, and so on. That metaphor didn’t last. People don’t lean forward and squint at web pages to figure out how they work anymore. They instantly recognize — within 100 milliseconds — which class of site a page belong to — search result, retail browse, blog, newspaper, spam site, message board, etc. And if they don’t recognize what kind of page they’re on, they generally give up and hit the back button. Our news pages didn’t conform to any standard metaphor. Some people thought they were search results. But they weren’t, our pure news search was a separate section of the site. Some people thought we were a newspaper, with human editors. Some visitors thought we were a blog. But our news items didn’t behave in very bloggy ways. Most people just didn’t know who we were or what the page was trying to do. Further confusing matters was our front page, which really didn’t have anything to do with the local news pages within the site. From the front we either looked like Google News or a national newspaper, depending on who you asked. To use the words from my original post – the original Topix was not “easy to learn”, and users had a tough timing understanding what to do there. In both of these cases, great content went unrecognized because users didn’t have a familiar frame of reference from which they could parse and hence appreciate the quality of the content. Once again, the takeaway is to make it cognitively easy on your users. Make sure that they know what to do at your site, and what to expect from it, as soon as they get there. In this case, quirky design, or sparse, stark design, is not your friend. This is doubly important if many of your users are not “regulars” – they arrive via search or links, and not as part of habituated behaviour. If they don’t “get it”, they won’t “get into it”. Posted by jeremyliew in Consumer internet, kosmix, Search, web 2.0. Last week Kosmix announced that Jon Miller has joined their board of directors. I’m very excited. Jon is one of the most visionary thinkers about the internet that I know. I was his chief of staff while he was CEO of AOL and was privilidged enough to have a front row seat as he took AOL from a shrinking dial-up-ISP centric business into an online media business driving 40-50% advertising growth year on year. I came with him from USA Networks/IAC when he took the CEO job at AOL in 2002. He is a great big picture thinker who can see several years and several steps ahead as the industry evolves. My partner Ravi Mhatre led our investment in Kosmix in the first institutional round (Jeff Bezos joined us as an investor in that round, and Accel joined us as an investor in a subsequent round). We introduced Kosmix to AOL‘s Search team in mid 2006, and when the deal wound its way up the AOL chain, Jon eventually met the company at the Web 2.0 conference last year. He immediately understood the huge opportunity in what Kosmix was capable of doing; using a search interface to automatically aggregate relevant web content and presents it in a familiar portal like page format. When faced with “research” type searches and topics where the user may not be familiar enough with a topic to refine search queries without some help (such as in healthcare), this is a truly better experience. After Jon left AOL earlier this year, we were able to convince him to continue talking to Kosmix as an independant agent, and eventually brought him on to the Board. Its great to be able to work with him again. Posted by jeremyliew in Consumer internet, Internet, social media, social networks, user generated content, web 2.0. I’m still fascinated by what lessons social media can draw from game design, and Amy Jo Kim’s work in the area. One of her game mechanics is “earning points”, and this is one of the ways that social media sites can incent the behaviour they want. One way to earn points would be to keep a create a complex scoring system rewarding multiple user behaviours that you want exhibited. If you were worried about it getting “gamed” by users, you could go so far as to keep the scoring system opaque so that users didn’t know exactly how points were earned. Another, simpler, way, is to simply keep track of each behaviour that you want separately, and prominently displaying those metrics for each user. This works especially well when the points are “awarded” by other players – taking advantage of another of her game mechanics – Feedback. 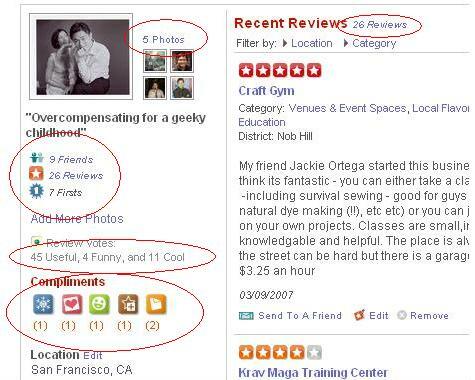 Note that each number (circled in red) corresponds to a user behaviour that Yelp wants. Most important of all is the number of reviews – in this case 26. But almost as important is that those reviews are of high quality – that they are Useful (45), Funny (4) or Cool (11). Readers of reviews can with one click rate a review as Useful, Funny or Cool, and this positive feedback incents users to write reviews that will earn the appropriate feedback. Another important metric for Yelp is Firsts (7) as this helps drive the coverage ratio of businesses that have at least one review. All these metrics help drive overall usefulness of the site for a casual visitor to Yelp . The remaining metrics help drive Yelp ‘s social network, their mechanism for rewarding review writers without having to pay them. Hence Yelp tracks the number of photos you’ve uploaded, the number of compliments you’ve received (by type) and the number of friends that you have. I suspect that these are all positively correlated with the number and quality of reviews that a user writes. An interesting point to note is that while reviewers rate businesses with 1-5 stars, users can only rate a review as Useful, Funny or Cool. There is no option to rate a review as Useless, Lame or Boring. Thumbs up, but no thumbs down. Why the difference? I suspect its because reviewers drive Yelp . Positive feedback is more likely to drive more reviews than negative feedback. (One of the “compliments” that Yelp users can send each other is even more explicit – “Write More!”). On the other hand, giving a business a poor rating (1 star for example) won’t change their behaviour towards the site one way or the other, and it is valuable information to users. I like this “keep it simple” approach to earning points far more than a single point score based off of multiple behaviours.